The boss of an NPE that launched in late June with $100 million of funding has said that within the next two weeks it will be filing “extremely large patent infringement lawsuits in China, against a major consumer products manufacturer”. Brian Yates, the CEO of iPEL, told IAM that the firm will be “asserting a minimum of 50 distinct patents against accused products inclusive of each of their major product lines”, and predicted that the case will result in “China’s first damages award above $100 million”. iPEL was co-founded by Yates, a long-time monetisation figure who formerly led Prognosis IP, and Rasheed McWilliams, who most recently led the litigation group at Cotman IP Law Group. It is promoting itself as an ‘Ethical NPE’, a term it has trademarked. In addition to offering free licences to small businesses and start-ups with annual revenues of less than $5 million, it has laid out a set of principles it will follow. Among these is a commitment not to litigate without first making an operating company aware of its existence and inviting an amicable dialogue under an NDA. This blog already reported on patent transactions made by entities affiliated with the firm back in March, before its formal launch. In a series of assignments recorded at the USPTO, iPEL picked up patents from ZTE, Panasonic and a number of entities controlled by Transpacific IP head Guy Proulx. That’s just the ‘protection’ money rhetoric. 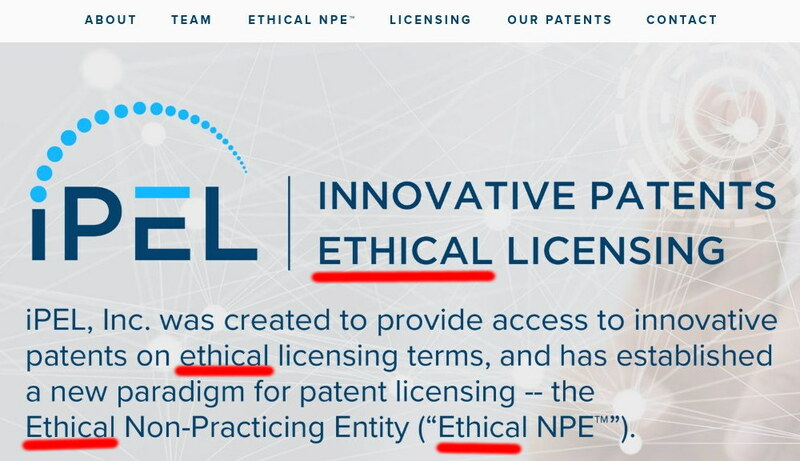 Notice, as per the above, that they even trademarked “Ethical NPE”. That’s like Donald Trump trademarking “Honest businessman”. How much of that “$100 million of funding” will be channeled/funneled into IAM, e.g. in the form of event “sponsorship”? Either way, they’re about to inflict a lot of damage. 4 days ago Buffalo Business First published a column titled “Fighting back against patent trolls” and here we are seeing IAM gleefully advertising patent trolls (in collaboation with them), having also promoted the UPC on the payroll of the EPO’s PR firm (Team UPC is a proponent of trolls, too). This is rather grotesque and anyone on the payroll of IAM should be utterly ashamed of himself (or herself; they recently hired one female too, the sole female in their team). It’s worth noting that many IAM writers left recently, including one female. Oppo has made its largest patent acquisition so far, taking in over 20 patent families – totaling around 240 individual assets covering audio and visual technologies – from Dolby. The transfer of the US rights involved was recorded at the USPTO on 23rd May. “EPO workers certainly know about the special relationship between crooked Battistelli and IAM.”But that does not speak of the great disparity in terms of patent quality. Not every patent office holds or maintains the same standards, so adding these numbers together would be pseudo-scientific, i.e. business as usual for IAM.